Aren't these placecards just so cute?! Lauren made one or each person. Everyone made the best food. We stuffed ourselves silly to say the least! ha! Lauren and Logan right when they met Belle! They love her. They are so good with dogs! Belle loved to play with them. Logan loved to play with Russell! They played ball for a little while. Look at Mama and Belle! I love this picture! This is Russell's aunt, Phyllis, and her granddaughter Aubrey. She is so sweet. Also is Russell's best friend from South Arkansas, Todd. He is so nice and is will admit he's a real country boy! This is all the "Lawson cousins" and their wives. Richard, Lori, Russell, me, B.J. and Katie. We finally got a picture all together! Jackie and Ricky loved Belle also! The Lawson family Thanksgiving was at Jackie and Ricky's and we ate SO much food there too! We got to visit so much with family we haven't seen in a while. It's always good to see family. We stayed with my parents this weekend and helped them decorate for Christmas. Today we left for Bentonville and it took us a lot longer to get home because there were SO many wrecks on the road. Glad we are safely home now and can't believe it it almost December! WOW! So the other day, Russell and I were shopping at Lifeway and we found this cd. Faith Hill's Joy to the World album is so awesome! We have really enjoyed it! 1. I LOVE to sing. I absolutely love to sing and always have loved it. I sang at my former church in Camden a lot and I would always get nervous. Sometimes my hands would shake uncontrolably while I held the microphone! We got to First Baptist at Bentonville now and I am in choir but am still nervous to sing in our "new" church! I wish I wouldn't get so nervous to this day! 2. I love candles and have way too many of them! 3. I think I could eat homemade macaroni and cheese every meal. HA! 4. I always have to have mentholatum on my bedside table every night...also chapstick. 5. I don't think I can have too many pictures of most anything! 6. I am kinda particular about little things like how you put things in the dishwasher. I don't know why! I need to pass this on to 7 people! I want to share a recipe with ya'll also! Mix chicken, soups, rotel and cheese together in large bowl. Dip chips in chicken broth. You may put chips in bottom of casserole dish or mix w/ other ingredients. (I do both) Pour mixture in large casserole dish. Sprinkle with extra cheese if you want to. Bake in 350 degree preheated oven for 1 hour or until bubbly. This is my mom's recipe. It is sooo good! Try it and I hope ya'll enjoy it! Russell is off tomorrow and we are going to my sister's for Thanksgiving Thursday. We will have a busy weekend but it'll be good! I hope ya'll have a wonderful Thanksgiving! AWW Classic Pooh is so cute! My sister, Kelly is loving this picture of Pooh and Piglet I bet because Logan's nursery was Classic Pooh when he was a baby! Anyway, I am soo ready for Thanksgiving. this year we will be at Kelly and Eric's house. I have SO many memories of Thanksgiving with our family. I remember a certain year when Daddy cut the turkey, mama made the mashed potatoes, Nanny helped with the dressing and I would sit with her and help her crumble all the cornbread for it! Kelly would make the best dessert ever-of course anything she makes is so yum! I really have to say that our whole family cooks a lot! I am so thankful for so many things. But the number one thing I am thankful for is my salvation. I am not decorating for Christmas YET but I will be listening to this wonderful cd soon! It is one of my very favorites! Emmanuel, Little Town, and Heirlooms are just a few great songs! 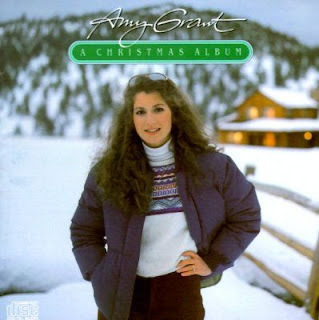 This album by Amy Grant is old but a definite goodie! We'll also be watching this soon! Christmas with the Kranks is a funny movie! It talks a lot about giving in this movie. "I'm Walking in the Air......" I can hear that sweet song right now! Anybody know what this is from? 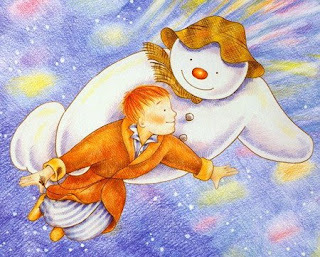 The Snowman! I haven't seen this short movie in a very long time but plan to rent it from Netflix or something. It is such a sweet story for Winter. I know Fall is still here but Winter will be here before you know it! Tomorrow is Friday! YAY! WOW! There's a lot to talk about today, ya'll! My wonderful friend, Amy called me today. She said that she and her husband, Tony are going to have a precious baby!!!!! I am soo thrilled for her! I know I mentioned this before but Russell and Amy are cousins on the Price side. We are just more than thrilled for them. OH! She also has a blog! Click on "The Talbert Trio" on my list of blogs to read her story! 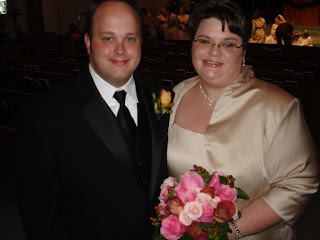 This is her 1st day of blogging too so go say hi and read her story! Love you Amy! Congratulations! Last night, we took our little puppy, Belle, to Pets Mart! I had her leash with us but she didn't walk at all! She is soo little and just wants to chew on her toys, eat, and sleep on her bed! OH! 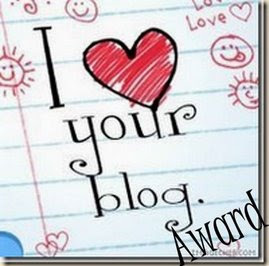 And Bekah gave me my first blog award! She is so sweet and I haven' t met her in person but our husbands know each other from Magnolia! Jenna mentioned this: Salted Caramel Hot Chocolate on her blog the other day! 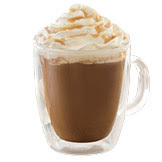 We also stopped by Starbucks last night to get one...HEAVENLY! I loved it! I still love caramel apple spice though! Well, I better go! I am making Mexican Chicken for dinner tonight! YUM! My mama's recipe! We are so excited! Meet "Belle" Diana Price (we'll just call her Belle but the rest is her "full name". Ha! Belle is a Cavalier King Charles Spaniel and is only 8 weeks old. Russell and I got her last night. This is me talking to Belle! The plate says Welcome Home Belle...I know she didn't care what it said but I still wanted to write that on the plate! She is just the sweetest thing! Russell adores her! She slept just about all night last night! And she loves her new doggie bed! She is in her bed right now actually! Soo pretty! Yeah, our dog was supposed to be a Christmas present to me but we started looking and just found the right one! We will definitely spoil this little dog! Jeremy Camp and other things! So the other day, Russell and I got this Christmas cd! It is soo good! I haven't listened to a lot of it because I am still in "Fall mode!" But what I have heard of it so far is SOOO GOOD! I love Casting Crowns. They are just an awesome Christian group! So this weekend we went to the Jeremy Camp concert! Here we are listening to the wonderful music! It was absolutely awesome. There were so many people worshipping and singing their hearts out to songs like "I will walk by faith" and "I still believe." There was a little boy that was on the row in front of us at the concert and he was precious. He was probably 6 years old, he was singing his heart out to EVERY song, and dancing away! He LOVED the whole concert and didn't care about what anybody thought of it either! I thought to myself, we as Christians need to have that mindset all day every day! Be enthusiastic about what blessings God has given you! And worship Him all you can! We didn't get many pictures but really enjoyed the concert. So I am totally ready for Thanksgiving! Aren't ya'll?!? I just talked with my sister yesterday and we decided I would make the rolls and dessert. So I am going to probably go with traditional pumpkin pie or pumpkin cheesecake...hmmm...well I am just talking and talking. I better go! 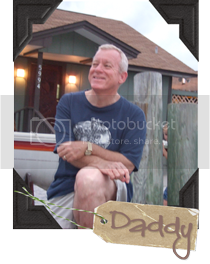 Just because I am thinking about how much I love my family today, I decided to put this picture on here. My family means the world to me. Just in case ya'll don't know everyone's names in the picture, in the front is Eric, my brother in law; Logan, my nephew; next row is my sister, Kelly; my niece Lauren; my Daddy, Jerry; and the next row is my wonderful husband, Russell, me, and my mama, Kathy. I don't have a lot to say but I wanted to do a quick post. It is cold and rainy here! It is a coincidence because the other day, Leigh Ann posted about the recipe, Cheeseburger soup! And I planned to make that tonight! I have had that recipe for a while and everyone loves it! YUMMY! Today is one of those days you just wanna get under a blanket, read and sip on hot cider! Hope ya'll stay warm!